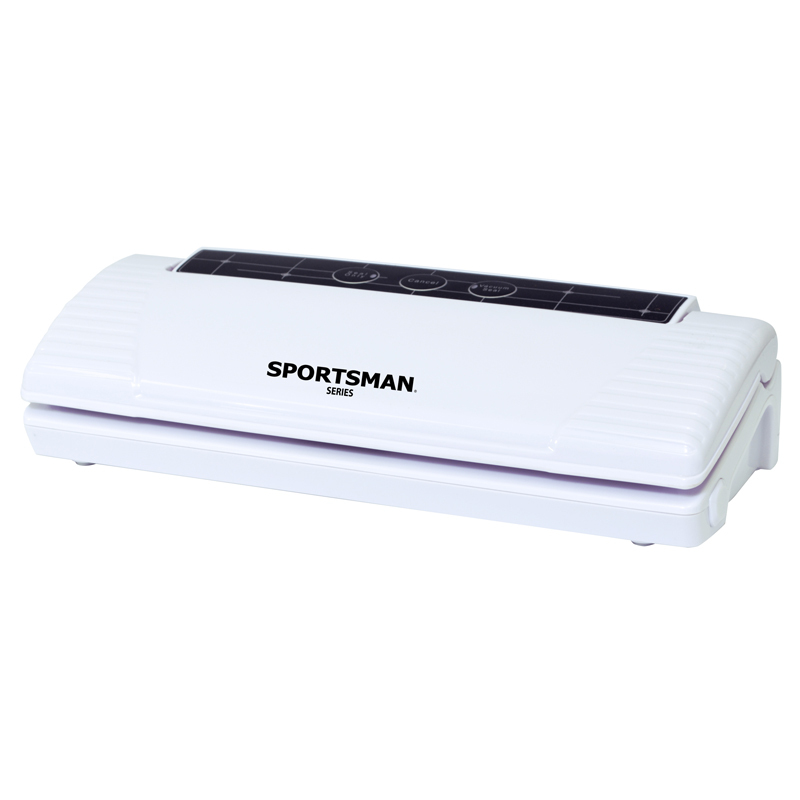 Save money and waste less food with the Sportsman Series Electric Vacuum Food Sealer and Preserver. 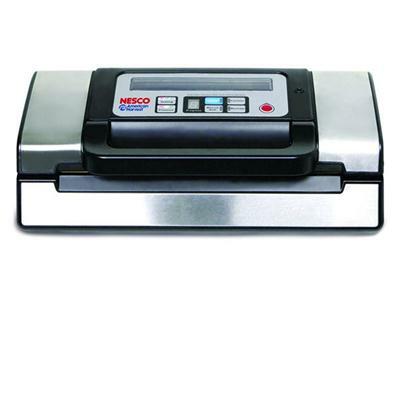 With this Food Sealer you can buy meat and other goods in bulk from the warehouse store, or when the grocery stores run a great sale, without the worry of spoilage or waste. The Vacuum Sealer preserves food up to 5x longer by creating an airtight seal that helps to prevent freezer burn, and keeps dampness and pests out of grains or cereal. 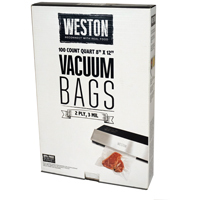 Included with the Electric Vacuum Food Sealer are 5 large and 5 medium vacuum bags to get you started. 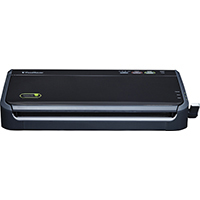 The Food Sealer is quick and easy to use. With the single push of a button, the Vacuum Sealer automatically removes the air from the bag and creates a strong seal. The vacuum storage keeps air away from the food and preserves the taste and freshness much longer than a traditional freezer wrap or bag. 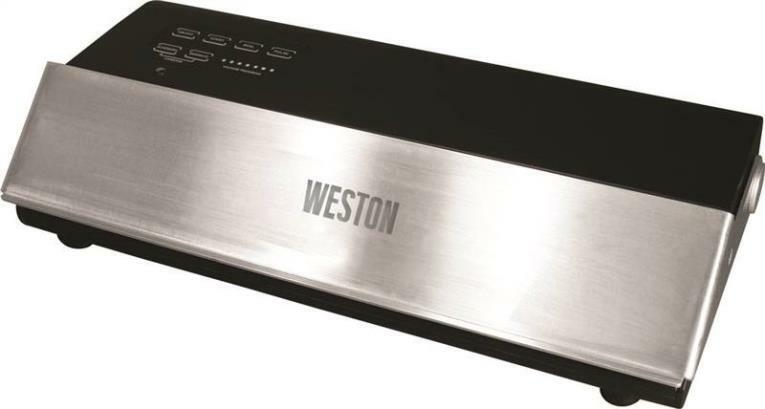 Weston Professional Advantage Vacuum Sealer - 210 Watt motor; backlit control panel; fan cooled motor prevents overheating for consistent sealing; seals bags up to 11" wide; angled vacuum chamber helps prevene liquids from entering vacuum chamber; automatic one-touch operation; marinate mode; manual seal mode; accessory button and hose port; Includes 5 pint 5 quart and 5 gallon.bonus vacuum bags. This item cannot be shipped to APO/FPO addresses. Please accept our apologies. 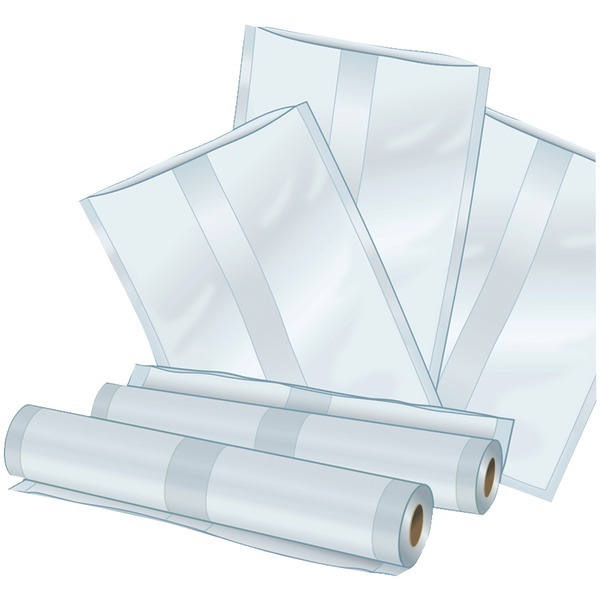 Vacuum bags can be used with most leading brands of out-of-chamber vacuum sealers. 100 each of quart size 8" x 12" Bags 2-Ply 3 Mil. Simmer or microwave right in the bag. BPA free. This item cannot be shipped to APO/FPO addresses. Please accept our apologies. 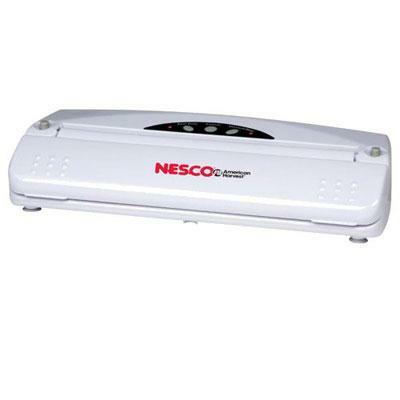 Save time and money with our NESCO VS-02 vacuum sealer! Prepare whole meals in advance & save leftovers. Eliminate freezer burn reduce spoilage and waste. Fully automatic one touch operation and automatic shut off makes this so easy to use. Seal only switch to prevent over vacuuming and crushing of food. 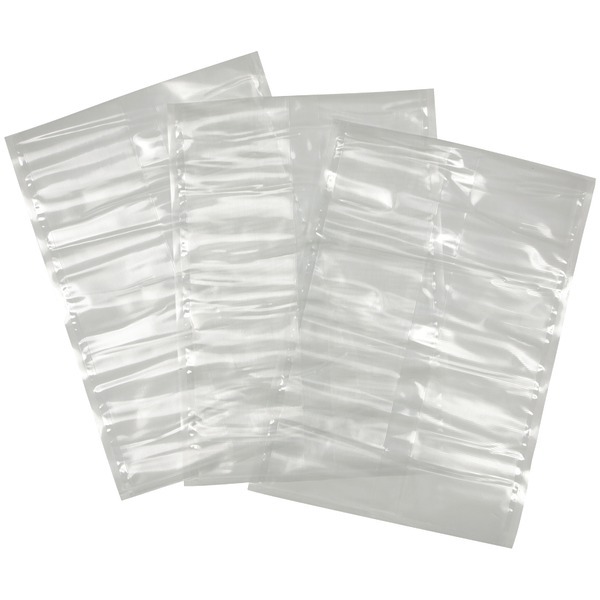 The VS-02 features extra seal time for thicker bags or wet items. The VS-02 also features a roll storage compartment with bag cutter. 110 watt unit. Accommodates up to an 11.8" wide bag or roll; The unit comes with: Two rolls of 8.66" x 9.8" bag material Five 8.66" x 11.8" bags Five 11" x 11.8" bags. This item cannot be shipped to APO/FPO addresses. Please accept our apologies. Vacuum rolls can be used with most leading brands of out-of-chamber vacuum sealers. 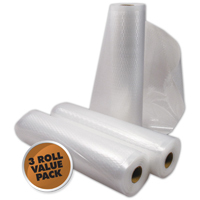 3-pack of 8" x 22' bag rolls; 2-Ply 3 Mil. Simmer or microwave right in the bag. BPA free. This item cannot be shipped to APO/FPO addresses. Please accept our apologies. 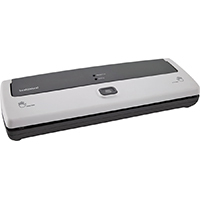 The Nesco Deluxe Vacuum Sealer features 130 Watts variable settings: Regular pressure for firm items and Gentle for softer foods. The sealing choices are Dry Moist and Double. Its double Vacuum Pump offers optimal performance. It has a Vacuum/ Seal/ Cancel buttons. It also offers Pulse Vacuum. It has an Auto Shut Off a manual seal feature and a clear viewing window in the lid. 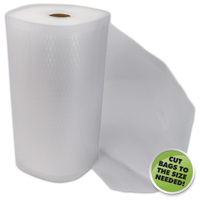 The unit includes one roll of bag material 8.7" x 9.85" and one roll of bag material 11" x 9.85. Stainless & Black This item cannot be shipped to APO/FPO addresses. Please accept our apologies. 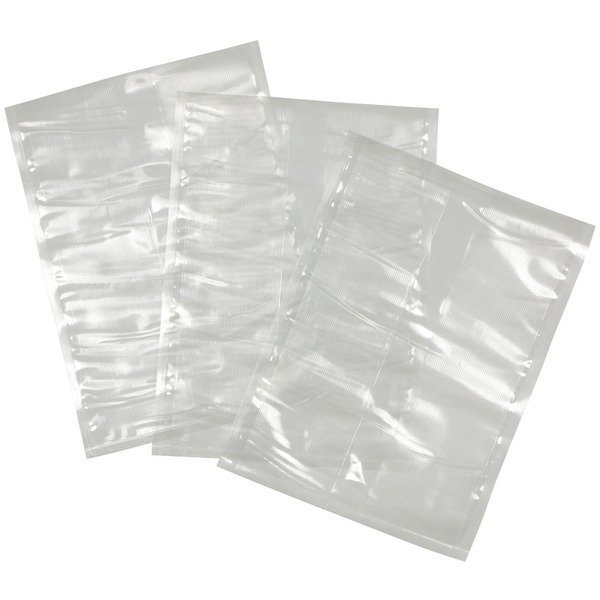 50 Pre-Cut Quart Sized Vacuum Sealer Bags (8.6" x 11.80"). Traditional storage methods can allow food containments to seep in. Oxygen-fed mold and bacteria cause food spoilage moisture leads to freezer burn. And penetrating odors compromise flavors. Vacuum sealing extracts the air and provides a moisture barrier so your food will stay fresh and last longer. 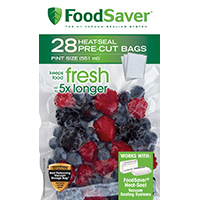 Nesco/ American Harvest's patented bagging material is specially designed to lock in freshness and flavor by keeping air moisture and odors out. The multi-layer construction is tear-resistant and features cross-venting channels on both sides allowing for maximum air extraction. It is BPA free and safe to microwave boil and freeze. You can even put them in the dishwasher & re-use. Material: Polyethene 80%/Nylon 20% BPA PVC and Phthalates free. This item cannot be shipped to APO/FPO addresses. Please accept our apologies. 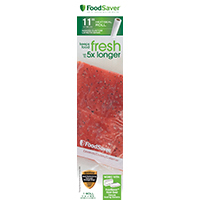 The Food Saver Vacuum Sealing System keeps food fresh up to 5X longer and saves considerable money annually allowing you to buy in bulk or on sale and preventing waste! Form & function combine with a sleek compact design and easy-to-use manual operation to preserve a variety of foods. Plus the new technology minimizes bag waste! Compatible with the FA2000-000 Handheld Sealer; Bagging material included; Also works with Seal-a-meal bags; 5-year limited warranty. This item cannot be shipped to APO/FPO addresses. Please accept our apologies. 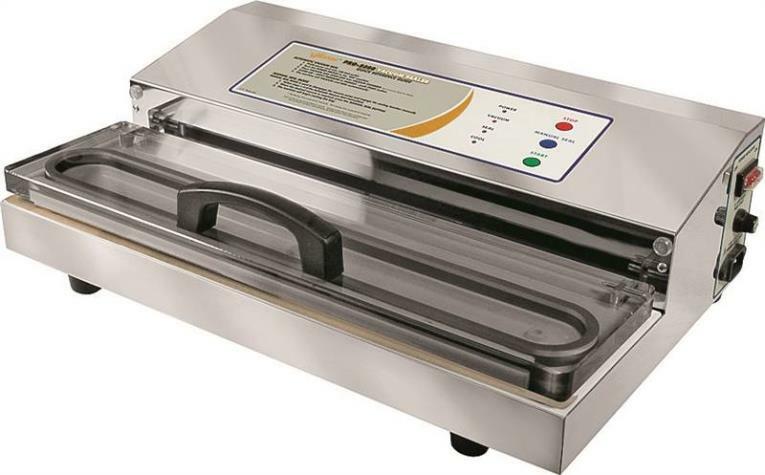 Pro 2300 Stainless Steel Vacuum Sealer. Commercial grade with an extra-large teflon bar for sealing bags up to 15" wide; double piston vacuum pump delivers 28" HG vacuum strength; Automatic one-touch operation - manual seal mode- see-through acrylic lid - easy to use LED lights. This item cannot be shipped to APO/FPO addresses. Please accept our apologies. 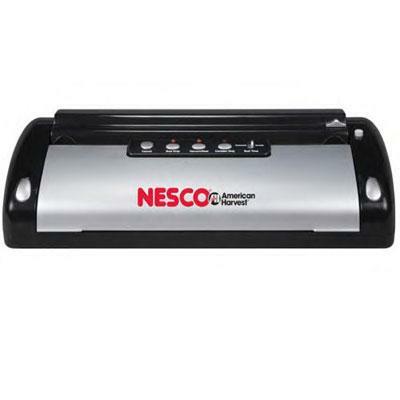 Save time and money with our NESCO VS-01 vacuum sealer! Prepare whole meals in advance & save leftovers. 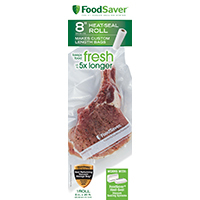 Eliminate freezer burn reduce spoilage and waste. 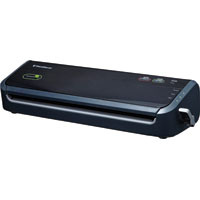 Fully automatic one touch operation and automatic shut off makes this so easy to use. Seal only switch to prevent over vacuuming and crushing of food. 110 watt unit. Accommodates up to an 11.8" wide bag or roll Unit comes with 20 bags (10) 8.6" x 11.8" bags (10) 11.0" x 11.8" bags. This item cannot be shipped to APO/FPO addresses. Please accept our apologies. 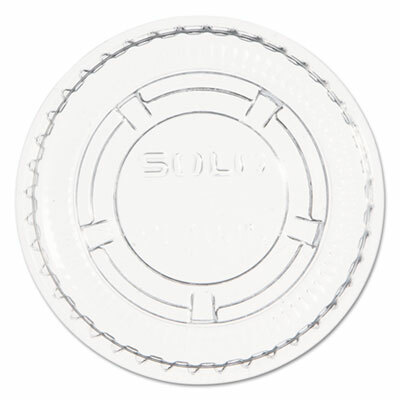 Precisely sized lids provide a secure fit when used with Dart� companion portion cups. Scored rim minimizes the potential for in-transit mishaps. Flat design simplifies dispensing. 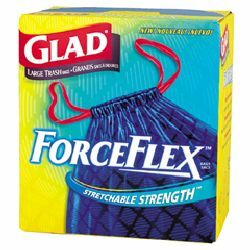 Fits: 1/2-1-oz Portion Cups; Material(s): Plastic; Color(s): Clear; For Use With: 050PC, 075PC, 100PC, 125PCG, P125N, P100BLK. 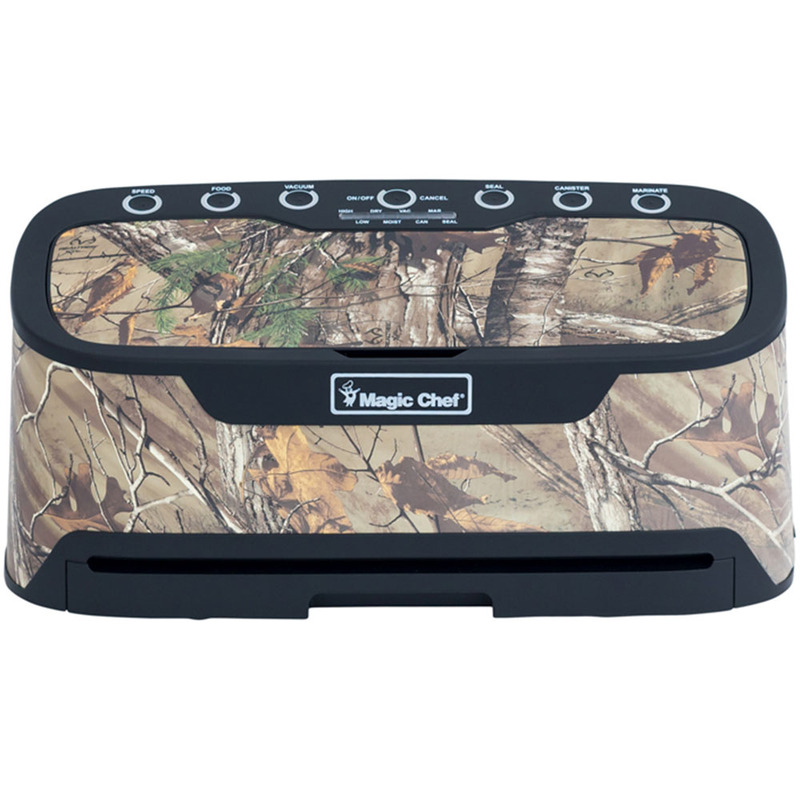 The Chard Vacuum Tumble Marinator has vacuum action that pulls marinades into your meat and the tumbling actions tenderizes in just minutes. This combined action has your meats ready for the grill in minutes rather than marinating them overnight. This item cannot be shipped to APO/FPO addresses. Please accept our apologies. 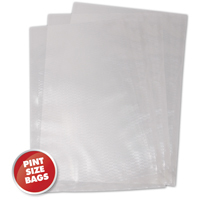 50 Pre-Cut Gallon Sized Vacuum Sealer Bags (11.0" x 15.75"). Traditional storage methods can allow food containments to seep in. Oxygen-fed mold and bacteria cause food spoilage moisture leads to freezer burn. And penetrating odors compromise flavors. Vacuum sealing extracts the air and provides a moisture barrier so your food will stay fresh and last longer. 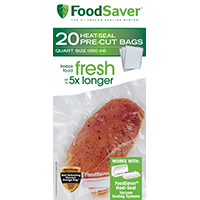 Nesco/ American Harvest's patented bagging material is specially designed to lock in freshness and flavor by keeping air moisture and odors out. The multi-layer construction is tear-resistant and features cross-venting channels on both sides allowing for maximum air extraction. It is BPA free and safe to microwave boil and freeze. You can even put them in the dishwasher & re-use. Material: Polyethene 80%/Nylon 20% BPA PVC and Phthalates free. This item cannot be shipped to APO/FPO addresses. Please accept our apologies.